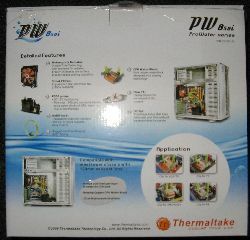 To spice up my new Antec Twelve Hundred, I was given a Thermaltake PW 850i ProWater water cooling kit to help overclock my rig. It's widely accepted that liquid cooling can lower CPU temperatures, lower case temperature and help you achieve a better overclock, but liquid cooling also presents a lot of hazards and installation trouble. Today we take a look at the Thermaltake 850i ProWater to see if the benefits of liquid cooling outweigh the risks, and if the Thermaltake 850i is up to par with other Thermaltake and liquid cooling products. 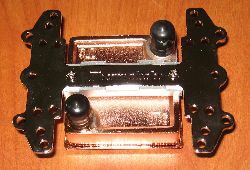 Waterblock: This is the component that sits directly on top of the CPU. It is made of hollowed out copper and the coolant runs through it taking the heat with it. It is important that this component be fastened securely to the CPU with thermal paste to get the best performance. A lose connection here will cost you big in performance. 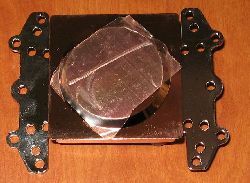 This component is made of copper which has phenomenal thermal performance, but tends to be pricey. Heat sinks and water blocks made with copper are generally regarded as being preferred due to their heat transferring proficiency. Flow Meter: The flow meter allows you to see the coolant move along the tube so you know the pump is working properly. When in use the red fan becomes a blur of red in a sea of green, interesting to see. Reservoir/Pump: The reservoir holds the coolant that isn't being used and gives it a place to continue cooling down. The pump is what applies the positive pressure to get the coolant all around your rig and then back to the reservoir to wait to begin the process again. These two components are linked together. The reservoir also serves dual funtions on initial start of priming the pump with water and throughout your use as your primary fill point. 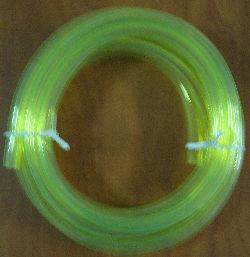 Tubing:The sturdy 3/8" tubing provides the means of moving the water around. 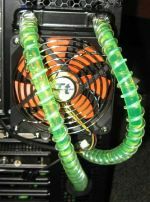 3/8" tubing isn't the largest, nor the smallest tubing for moving coolant. It provides a careful balance of flexibility, support, and volume of water moved for optimal performance and ease of installation. Radiator:This is where the heat actually gets dissipated and is as equally critical to the cooling process as the waterblock. 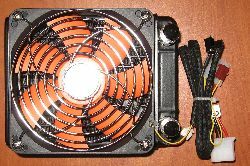 It is ideally mounted outside your case so that your case's cooling system has less to deal with. This component is made of Aluminum, which doesn't get as good heat transfer as copper, but it makes up for this in the huge surface area it has. Don't let its enclosure fool you, inside the fins weave around giving it the surface area it needs to easily dissipate a large amount of heat. Water cooling offers a number of advantages to users interested in performance. 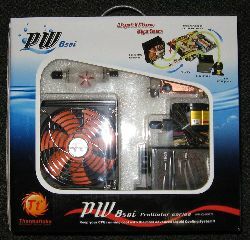 Water cooling lets you run components of your computer under increased voltages and under more stress without the associated heat buildup than any other cooling solution in its price range offers you. It also takes the heat off the components and moves it outside the case allowing your case cooling system to work more efficiently. This leads to dual benefits, not only does your CPU operate at lower overall temperatures but your motherboard, hard drives, and other components benefit from the heat removal of the CPU and thus operate lower as well. Water cooling isn't magic though, its performance is firmly grounded in thermodynamics. Oversimplifying it, water is much much more conductive to heat than air. This heat capacity is further enhanced by running the water past the CPU as fast as possible thus allowing additional cooler water to continue to pick up heat. 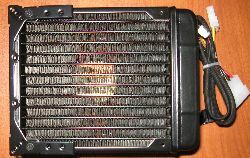 This allows you to utilize the tiny surface area of the components to take all the heat to a location where you can use a large radiator with an air-blowing fan to cool the water off. This is important because the number one important factor in terms of moving heat is surface area, and this method allows you to move the heat efficiently to a location with a lot of surface area.